To what degree are you using these three skills either as a leader or as an advisor to leaders? 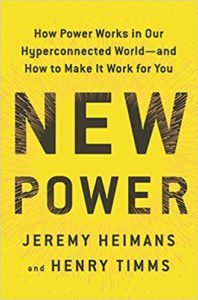 Here’s how authors Jeremy Heimans and Henry Timms define these skills in their new book New Power: How Power Works in Our Hyperconnected World—and How to Make It Work for You. The examples I’ve provided are from my client Planned Parenthood Federation of America and its political and advocacy arm, Planned Parenthood Action Fund. Signaling is the way leaders use their speech, gestures and actions to make others feel like they are active participants and to an extent, share the power. Example: In her talks and media interviews, the former president of the Federation and Action Fund, Cecile Richards, regularly expressed gratitude to Planned Parenthood’s patients for helping the organization advocate for reproductive rights. Also the social media hashtag #IStandWithPP encourages supporters to show they back Planned Parenthood. Structuring is the way leaders use practices, policies and processes to encourage more participation. Structuring is harder to do than signaling because it requires more complex actions. For example, the organization adds new components, adjusts current ones, or even removes existing ones to help participants get more involved. Example: To get more young people active in the organization and the movement, PPFA started Planned Parenthood Generation Action Network a few years ago. The network helps young organizers and activists set up events to mobilize more advocates for reproductive health, rights and freedom. These organizers and activists also learn how to improve education about sexual health on their college campuses and in their communities. Shaping is how leaders set norms and directions for their organization or movement that often go beyond the leaders’ formal authority. In fact, “new power” leaders shift the focus away from them and toward the communities they help build. Example: For the past two years, the Planned Parenthood Generation Action Network has teamed up with the activist training academy Change Corps to offer a “Summer of Defiance” in selected states around the U.S. These paid fellowships provide a four-week immersion course for young leaders ages 18 to 25 to learn how to engage their elected representatives and communities on a range of progressive issues, not just reproductive health. During Cecile’s tenure over 12 years from 2006 to 2018, the number of active Planned Parenthood supporters more than tripled, surpassing 10 million. Granted, when you lead or work for an organization that describes itself as a movement, it’s more natural to push past the organization’s formal structure. That way you can play an important role in a larger participatory eco-system and make a bigger impact. Even if you feel you need to stay within your organization’s sandbox, you should be aware of these three skills and think about how to apply them effectively in your setting. Why? 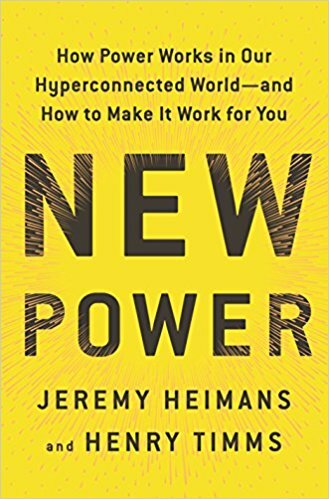 The current connectivity that we humans now have through technology—or hyperconnectivity according to the authors—is influencing how we think and act about power. As the authors explain, “new power” is open, participatory and peer-driven; it’s a current that many make. By contrast, “old power” works more like a currency. Those in power, or those who seize it, jealously guard it and aim to make others comply with their orders. Like many things in life and work, “old power” and “new power” are not binary choices. Instead, old and new powers are blended. The degree depends on the leader, the participants, the organization and its culture, the environment and other factors too. Nevertheless, even if you’re in a traditional organization, you’re working with employees who have greater expectations for being seen, heard and involved. So how about starting to signal your desire to listen and encourage greater participation? If you’re moving into a new role, you’re in a great opportunity to broaden your thinking and try new ways of working, which can make you a better leader. Regardless of whether you’re in a new role or in your same role, you—or your advisors—should think about the language you use. Leaders’ words need to be inclusive and gender neutral in 2018. If you gravitate toward literary language, including alliterations, you may have to stretch outside your comfort zone. Just think though—you’ll be trying new ways of working while supporting “new power.” And that’s good for your brain, your relationships and your performance. Are you ready to intentionally signal, structure and shape to become a better leader? A handy view of the various forms of power — French & Raven. They describe 7 powers. From Charisma to Punishment. Only Hierarchial power is the one on the organizational chart.